Rockstar Energy Husqvarna Factory Racing headed to St. Louis after a couple of very tough prior weekends. Unfortunately it would be a solo mission after Martin Davalos was sidelined to try and recover from his recently diagnosed illness of epstein barr. Luckily for Jason Anderson after a scary and spectacular crash in Detroit, he was relatively unharmed aside from some sore ribs and bruised. Before the incident he was riding great and looked to turn around his season and be back on form. That effort carried over into the Edward Jones Dome where he rode great all day long. Anderson was not a new man in Missouri but he was finally himself again. The Jason that won a 250 west coast championship last year. The young man that's always smiling and joking around. The JA we have all come to know. His entire day was a sign of things being back on track. In practice 1 he was 4th, in practice 2, he was 4th again. Then in the final qualifying practice, he set the 3rd fastest time for the session. One thing that has been hampering Anderson are his starts. He has struggled to even round the first turn in the top ten and that is a must to equal quality results in the top 5. He made a marked improvement in that category in both tries. In his heat race, he quickly moved into qualifying and comfortably kept that position till the end. Still being a little banged up fro the past weeks, that was certainly a benefit, avoiding a semi qualifier or at worst case the LCQ. Jason went back to the truck and rested up for the main. When the gate dropped for the big show, Mr. Anderson got out of the gate fairly well with a nice jump, then muscled his way through the first couple turns to get into a top 5 position. He continued to move forward and found himself in 3rd on Weston Peick's rear wheel. As he was trying to find a way around one of the toughest riders on the track to pass, he also had a hard charging Eli Tomac in tow, who some consider the fastest rider on the course. This is a difficult situation to be in. While you want to take every line possible to pass the rider in front of you, one wrong decision and you will end up losing a position to the competitor behind and completely lose your momentum. Anderson then found a line he hadn't attempted all day in the split lane rhythm section. Because the opponent in front was using the other lane, he was able to make up a lot of ground in a safe manner. JA moved into 2nd place, a position he held for much of the main. He eventually succumbed to the pressure from Tomac, but then made a charge to catch him in the waning laps. He was unable to get close enough to make a move by the time the checkers waved but it was a very impressive ride as it was and his first podium since the opening round. 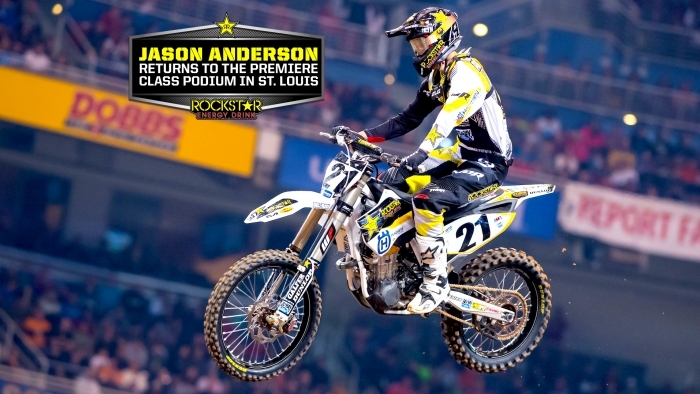 Jason Anderson: "I think things are going in the right direction. It took twelve races too long but we got a podium and I'm just pumped. All day was good, I was kind of not used to riding up front because it's been a while since I've done it but it felt good up there and I was riding really good and trying to change up my lines with the track conditions. I didn't do the triple in the middle rhythm section till the 5th lap in the main. Hadn't done it all day. Going double, double had some pretty deep ruts and going double, triple made you miss the ruts so I thought it was safer and it ended up being faster I think. I'm trying to make smart decisions out there and I think that helped me stay in the podium hunt. All in all I'm happy to put my Husqvarna up on the podium and really pumped for my team. This is something we needed going into the little break." The entire team will now get a much needed break and a weekend off. Although they will still be working and riding and testing during the week, they will get a little down time over Easter weekend. The next round of racing will be the following weekend in Houston where Anderson will be rejoined by West Coast cohorts Zach Osborne and Zach Bell.